Gain Immediate Value from Your Connected Factory Architecture! Imagine if you could reconfigure your production line in days instead of weeks. Or if you could cut long search times for parts in half using factory wireless across a connected factory architecture. These are only a few of the reasons why leading manufacturers deploy Cisco’s Connected Factory Solution. 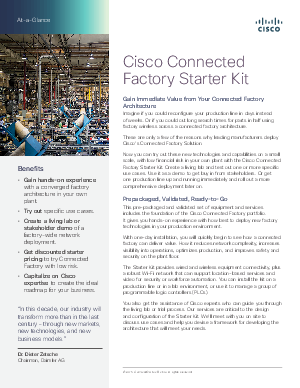 Now you can try out these new technologies and capabilities on a small scale, with low financial risk in your own plant with the Cisco Connected Factory Starter Kit. Create a living lab and test out one or more specific use cases. Use it as a demo to get buy in from stakeholders. Or get one production line up and running immediately and roll out a more comprehensive deployment later on.